TracePro offers luminaire designers the most accurate and comprehensive design environment available. Luminaire design often involves strict adherence to system performance criteria, including spatial and angular light output distribution, uniformity, intensity, and spectral characteristics, along with aesthetic factors, such as lit and unlit appearance. TracePro gives luminaire designers the confidence that the performance and aesthetics of finished products will concur with the simulated design without costly prototype iterations. 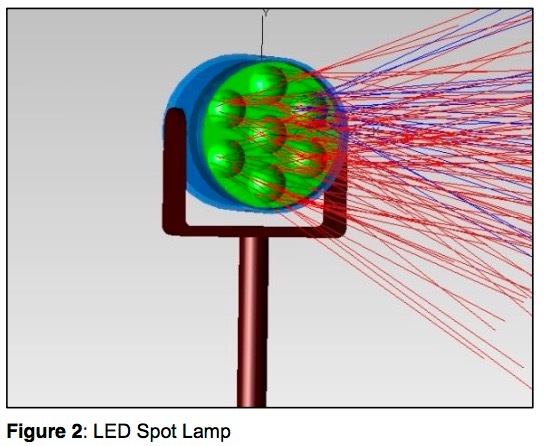 Luminaire Mechanical Design can be accomplished using TracePro’s interactive solid modeling facility with its familiar and intuitive CAD interface or importing models from popular CAD Programs, such as SolidWorks, ProE, and AutoCad. In addition to the import capability, Rayviz for SolidWorks, encapsulates optical and mechanical properties in the same CAD file for seamless and parallel interoperability between TracePro and SolidWorks. Light Sources and Surface Properties are represented as grid, surface, or ray file sources using ray data derived from measurements. Source specification can also be accomplished using actual source geometry and defined completely using the TracePro sketch facility. Source and material properties of commercially available lamps, LEDs, optical components, plastics, metals, and epoxies can be utilized in TracePro from its properties database. 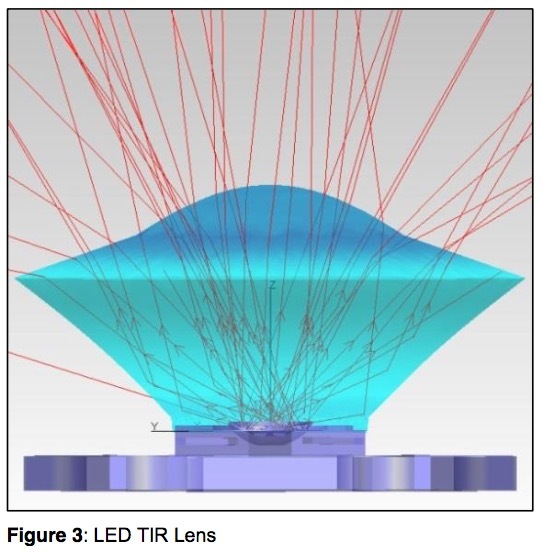 Use Lens and Reflector Design to optimize lenses, reflectors, and sources based on lighting product performance criteria and industry standards. 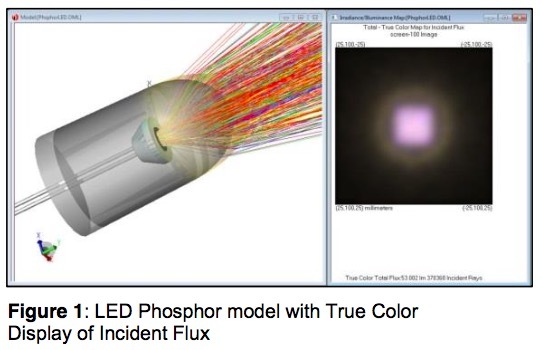 Analyze output efficiency at the component and system levels for illuminance and candela distributions. 2D and 3D Design Optimization starts with the user sketching an initial luminaire design using the sketch utility. Once you define optimization variables, variable limits are displayed graphically on the design for visual confirmation before and during optimization. This ensures that control and segment variable points do not overlap during the iterative optimization process, which greatly reduces the possibility of creating an unmanufacturable design. Includes available surface types used to draw the objects, such as Planar, BSpline (free, X, Y, XY), Parametrized (biconic surface), 2D profile (asymmetric, symmetric, elliptical), and user-defined Path (2D, 3D). Creates objects from the surface list using Radial Symmetry, Extrusion, Lens, Sweep, and Biaxial methods; establishes initial parameters that can be adjusted in the Property Editor. Uses operands to specify values on which to optimize, including: flux, color space (CIE), irradiance distribution, irradiance profile, intensity, candela profile, and uniformity; allows you to define your own optimization targets.